Do not be fooled: while both Polar and Wahoo offer heart rate monitors you can wear on your upper arm, it was Scosche who did it first – and proved that moving the sensor technology a little higher up had the potential to deliver accuracy on par with chest straps. The Scosche Rhythm+ is still considered one of the best heart rate monitors out there, and with the arrival of the Rhythm24, the company wants to continue offering that accuracy for anyone still not satisfied with what wrist-based monitors offer up, or who simply doesn't like wearing a chest strap. It still employs light-based, optical sensor technology similar to what you'd find in an Apple Watch or a Fitbit Versa – the difference here is that Scosche's PerformTek sensor employs green and yellow optical sensors to ramp up that accuracy on all skin tones. It's also going to have big appeal for swimmers, too, as it's IP68 certified, meaning you can take it in the pool for your swims and still access heart rate monitoring. And in case you were wondering, that's something neither the Polar OH1 or the Wahoo Tickr Fit HR armbands can offer. 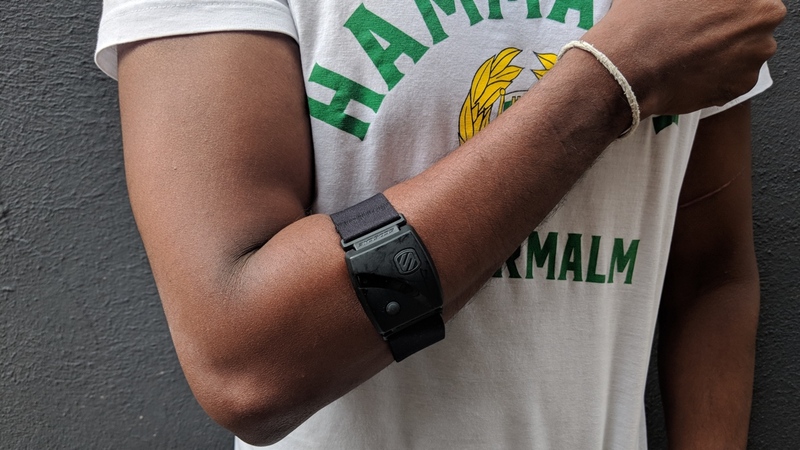 We've been spending some time getting to know the $99.99 Rhythm24, to find out whether Scosche has managed to make its heart rate monitoring armband even better. Scosche might have been first to the party, but the design has certainly not evolved that much from the original version. You still get that elasticated strap that sits around the upper half of your arm, just below the elbow. These bands are interchangeable and cost $14.99 if you fancy a splash of colour, with black, pink, blue, purple and green options available. That holds the tracking module in place, which has now inherited an additional button that's used to record a session. You can store workouts onto the wearable and then sync it later, which is a really nice touch if you just want to work out with the Rhythm24 and nothing else. Well, no other tech, that is. There's a central LED array in between the multi-function button and the record button, and that's your way of knowing a few things without looking at your phone or whatever device you have paired to the armband. The first is displaying heart rate zones, with blue signifying zone 1, green for zone 2 and a rapid red flash indicating you're in zone 5. You can also input resting heart rate and maximum heart rate in the companion Rhythm Sync app (iOS only) to make sure heart rate zones reflect your current fitness levels. The other use is that it will tell you how much capacity is left on the device to store workout data, with the ability to quickly clear memory from the wearable before you start recording again. The big appeal of a HR armband over a chest strap, much like a watch, is that it's more comfortable to wear. Thankfully, that's the case with the Rhythm24. While it sits bigger on the arm than the Polar OH1, we did find that it was a snug fit, whether we were running outside, on a treadmill, on the rowing machine or having a weights session. The key is to not wear it too tight, so as not to restrict arm circulation, and the adjustable strap can ensure it's not going to slip or move around. We're glad to report that hasn't happened during our time with it. The Rhythm24 is ANT+ and Bluetooth Smart-compatible so you can use it with a whole bunch of third-party fitness apps, sports watches and sports equipment. But you also have the dedicated Scosche companion app (iOS only, with an Android app on the way) where you'll find dedicated profiles for a range of activities. That includes running, cycling, a multi-mode, duathlon and triathlon, where it can record data from each stage, and there's even a heart rate variability mode to offer insights into stress and recovery time. We've focused primarily on running for our testing. Unfortunately we weren't able to test the swimming mode, which is one of the more desirable features of the Rhythm24. That was due to the fact that our sample having an issue with the seal around the device. That means while it was still fully water resistant, it could leak if submerged for an extended period of time. It's an issue that Scosche is aware of and says it has now addressed. We'll be updating our review to test its swimming credentials once we have a suitable model to use. As far as getting things going is concerned, it's really easy. We used the Rhythm Sync app to pair and sync data, and pairing works pretty much instantly. What you'll get in the app is a live BPM reading along with your current heart rate zone and the current sport profile. It's then simply a case of turning the device on by holding down the button with the big 'S' on it and then hitting the record button. Accuracy is what we were looking for, and thankfully we found it. We put it up against a Polar H10 and the Garmin Forerunner 935's onboard heart rate sensors. It's the chest strap accuracy though that we sought and Scosche promised its armband would deliver. We put through a mixture of running, from slow, long runs, 5K races and interval training to see if it delivered where most wrist-based sensors ultimately fail – the high intensity interval training test. Much like our time with the Wahoo Tickr Fit and the Polar Oh1, the Rhythm24 delivers the goods. It was never more than 1-2 beats out for accuracy and, unlike the wrist-based monitor, didn't overestimate maximum readings or take that bit longer to drop back down to our resting heart rate during interval running training. In race conditions at the Simplyhealth Great Team Relay, it was the perfect opportunity to see how the Rhythm 24 performed when up against high intensity, and we were left with more faith in its performance than that of a sports watch. Once the session is over, it's time to head back to the app, where you'll need to open up the dropdown menu to sync your workout. After a quick scan for the armband, it'll pull out any of the workouts stored on the device, noting the data, time and file size. From there you can choose to export or share to compatible services, which includes Strava, Apple Health and Training Peaks. Once you've configured your sharing options, sending workouts to other apps is a lot easier to do. Once you've compiled a large number of workouts on the device, we can imagine syncing workouts being a bit messy, so it'll definitely pay to sync regularly and clear up workouts you no longer need to sync. The Sync app itself is pretty basic, because it's simply built for, well, syncing. While it does offer the ability to store your details (weight, height, heart rate limits), the main focus here is to push your data to another health and fitness app. In terms of battery life, Scosche claims you should get 24 hours of tracking before you need to clip it into its charging cradle. Based on our time with it, that would seem be accurate. It's suitable for anyone who tends to go for 30 minutes or 1 hour sessions regularly during the week, but also seems equipped to last for those longer distance runs or training sessions. We took part in the Simplyhealth Great Team Relay as guests of Simplyhealth, the everyday healthcare provider supporting runners every step of the way. The Scosche Rhythm 24 is an improvement in multiple ways on its predecessor, but crucially it delivers where it matters most for us and that's accurate heart rate monitoring. If we could test its reliability in the water, then maybe it would've scored higher (and we will return to the review when we can). Compared to rival bands from Polar and Wahoo, it offers more onboard features, and relies on third party app support to make sure that data lives in the apps you already use. While it's not the best-looking device you'll ever see and we'd probably like it to be just a little smaller and more discreet, there are some really nice touches that should make the Rhythm24 a valuable training tool for beginners or serious athletes who hate chest straps or don't trust wrist-worn HR monitors.